Sometimes it’s easy to get very down about the state of our landscape in 2016. Old timers, among whom I count myself at this point, have to hope that coming generations will not have lost the connections to nature that we grew up with when there was more of the natural world about us. E.O. Wilson, the “father of biodiversity”, defines “biophilia” as the innately emotional affiliation of human beings to other living organisms. We see it in children’s fascination with such things as dandelions and earthworms, and in their crayon sketches. 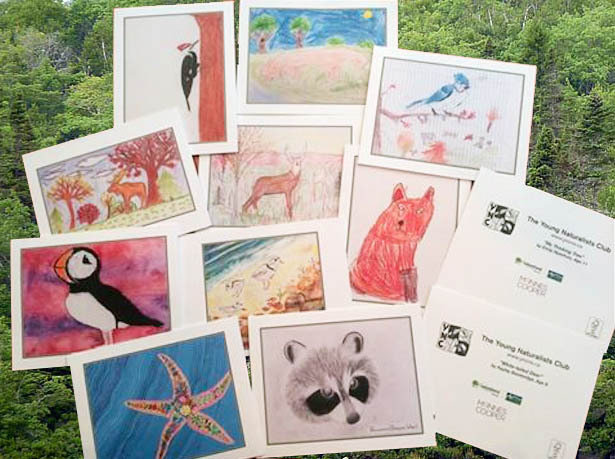 Some wonderful expressions of biophilia reflecting the species and landscapes of Nova Scotia can be seen artwork by children who participated in a nature art contest held by The Young Naturalists Club of Nova Scotia (YNC) in 2015. The YNC received 206 entries in the Junior Art category (ages 8-12) and 133 entries in the Senior Art category (ages 13-15) with entries from all around the province. The results are truly inspiring, and provide evidence that in spite of all of the complexities of modern life, kids still possess a natural love of nature. Cards with their wonderful artwork are now available from the YNC. See Youth Nature Art Cards.